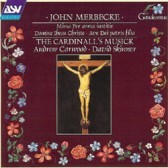 The composer John Merbecke is perhaps best known for his setting of the words from the Book of Common Prayer still sung in many churches to this day. But before his Protestant days he was a committed Catholic and wrote music in the grand pre-Reformation style. Here for the first time on disc is his monumental Missa Per arma justitie and two substantial votive antiphons: his complete Latin output left to us after the ravages of time.